Introducing the very first ready-to-use clay paint on the market that has no preservatives at all. AURO Clay Paint is a highly breathable paint for use on interior walls and ceilings. It can be used on all plasters including lime plaster. The High-grade Clay paint with its moisture-regulating and breathing characteristics is suited for all living areas. 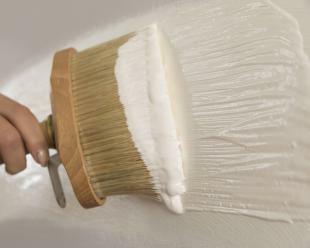 The indoor paint helps to regulate the indoor climate and thus contributes to a sense of well-being at home. This is particularly good news for allergy sufferers. The clay paint is also perfectly suited for kitchens and bathrooms because the binding agent REPLEBIN® makes it very resistant against spray water. *REPLEBIN® is a legally protected development, a result of AURO's own research. The biogenic nature of the binding agent is regularly examined and confirmed by SGS INSTITUT FRESENIUS. AURO, as always, use raw materials chosen in an environmentally compatible way. They come from mineral or organic sources and can after use be returned into the natural materials cycle. AURO do not use synthetic materials. Full declaration can be found on the website or on the technical data sheet. 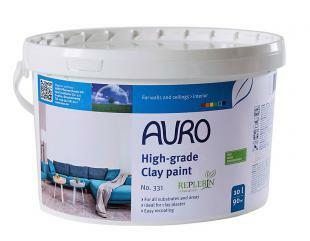 Does the AURO Clay Paint have any preservatives or Thiazoles? AURO 331 High-grade Clay Paint is completely preservative free so it does not contain any of the above.